They say you can’t judge a beer by its label, but I beg to differ. If I come across a beer can or bottle with a fish on it, I automatically hold it to a higher standard. 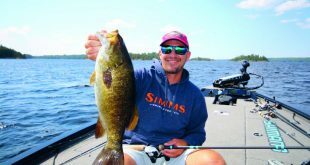 Fishing and drinking beer are two of my favorite pastimes, so it only makes sense to combine them. For example, I recently came up with the following brilliant idea. 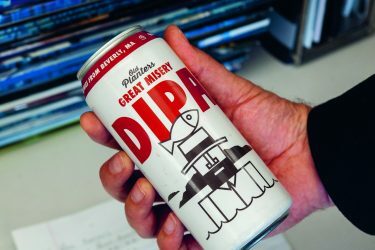 In order to enlighten our fellow beer-drinking fishermen, I decided we should begin a quest to find, sample and rate all the “fishy” brews available in the Northeast. Our staff contains some bona fide black-belt beer drinkers, a veritable dream-team of judges for sure. I scoured liquor stores far and wide for their fishiest brews, and we got to work on our new assignment. Our criteria was simple. To be considered a fishy beer, it must either have a fishy name, come from a fishy brewery, or have a fish pictured somewhere on the label. 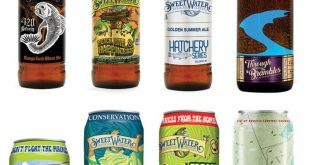 We managed to track down 11 beers that qualified, and then rated them on a scale from 1 to 10. Here are the official results (in no particular order). This was one of the priciest beers we sampled. Its high cost and high alcohol content gave me high expectations, yet it turned out to be the lowest-scoring brew in our review. The beer is described as an “imperial porter with coffee & vanilla flavors.” It is aged in bourbon barrels, which added a hint of smokiness. This was a heavy-duty beer with a heavy flavor; unfortunately, the flavor wasn’t that of traditional beer. Thick, filling, and slightly sweet, it might be good paired with a dessert, if you’re into that sort of thing. It wasn’t terrible, but it was not a good fit for the typical beer drinker. Wait! What’s wrong with this label? This was the most expensive beer in the battle. 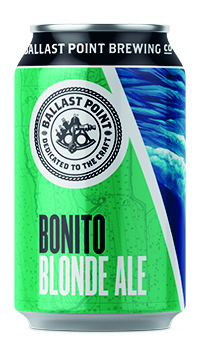 Its label claims, “This wheat IPA is brewed with citra and simcoe hops, creating a balanced flavor of hops and wheat.” It has a pale golden color and pours with an impressive thick, white head. It had just a touch of citrus flavor, and overall, was very smooth, mild, and easy-drinking. It scored well, but I’m not convinced it’s worth the high cost. My biggest beef with this beer is the label. 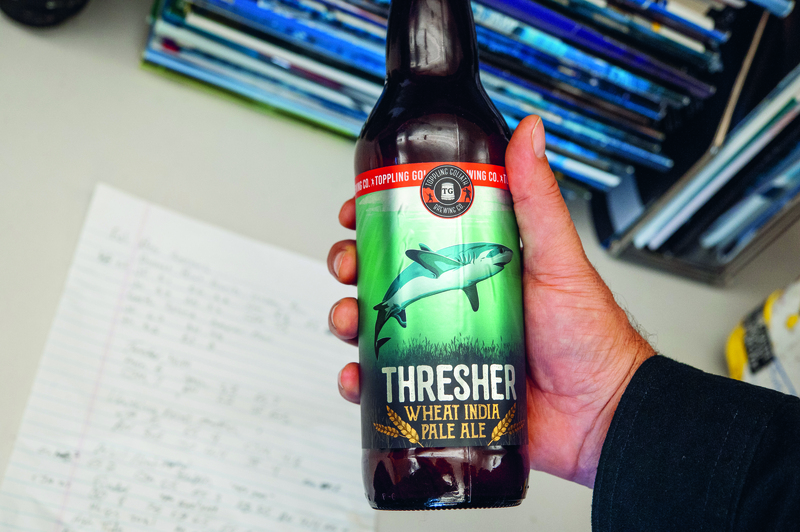 I didn’t notice it when I bought it, but upon closer inspection, the shark on the label is clearly a great white, not a thresher! Since it comes from Iowa, I’ll cut them a little slack, but c’mon, man! That’s not right. At first glance, I didn’t consider this a fishy beer. The name alone was not enough to meet our criteria, but look closely and you’ll notice a subtle striped bass scale pattern in the background of the label. It turned out to be one of our top-rated beers. Even with such a high alcohol content, it was surprisingly smooth and not overly hoppy. I will buy this one again. I’m still a little confused with what’s depicted on this can. It appears to be an Amish man standing in water with a fish on his hat. What the heck? I’m not sure what the story is, but there is clearly a fish on the label, so we reviewed it. The beer was pretty good and scored well. It was surprisingly easy drinking for a double IPA. 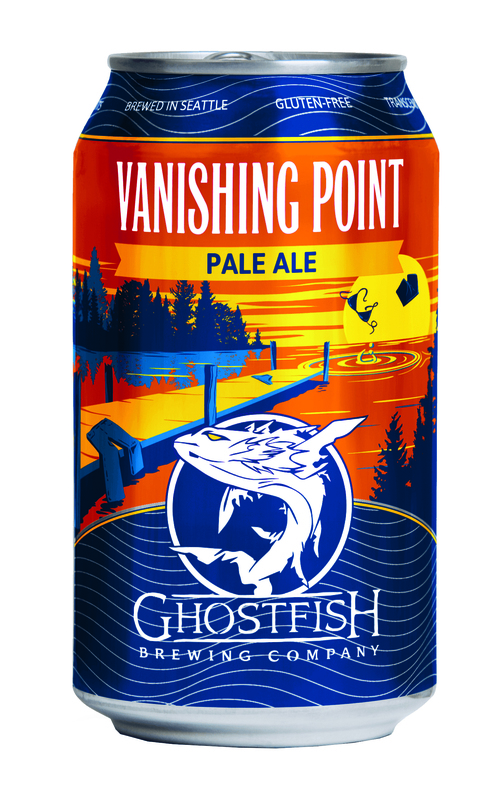 I’ve never caught a ghostfish, and after drinking this beer, I never want to. To be fair, the beer is gluten free, the only one in our taste test, so I think that gives it a major handicap. It had an interesting earthy/bready aftertaste. Unless you’re gluten intolerant, I recommend you stay away from glutenfree beers. 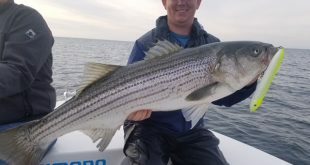 While I’m not 100% certain that this beer was named after a “keeper” striped bass, I can attest that Castle Island, located in Boston Harbor, is indeed a fishy location and is the home of the Lt. John McCorkle Fishing Pier, a popular striper fishing destination. I discovered this lovely brew about a year ago, and it has become one of my favorites. It’s fresh, flavorful and refreshing. l personally gave it a score of 9.6. The good news is, this beer is delicious. The bad news is, for now, it’s only available in Seaside Heights, New Jersey. 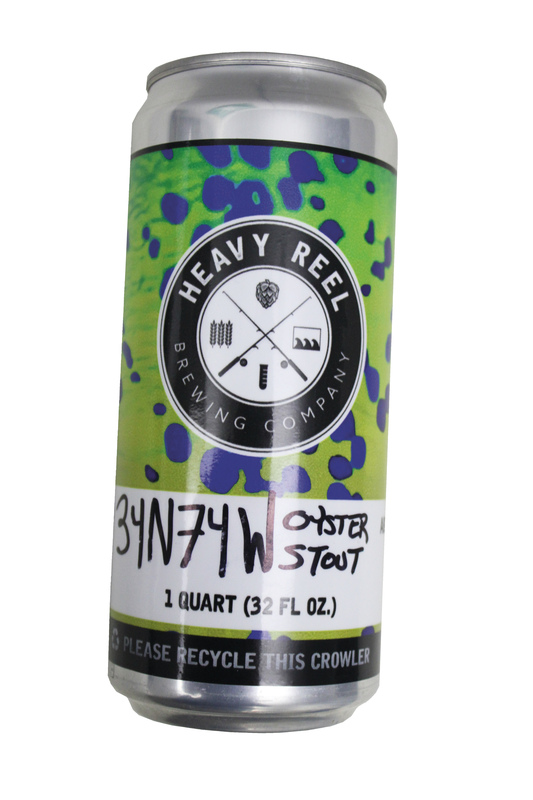 Heavy Reel Brewing Company was founded in 2018, but hopefully they will be coming to a liquor store near you in the future. For a stout, this brew is seriously smooth and easy to drink. It has a rich, dark color, and pours with a glorious coffee-colored head. 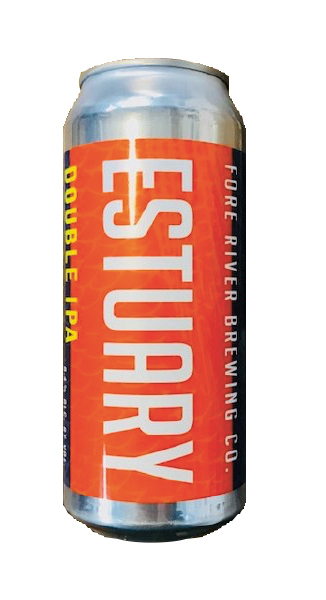 This beer is actually brewed with oysters, which sounds weird, but adds a pleasant brininess to it. This was our highest-ranking brew. This one was a real dud. I thought it tasted old and stale, which it probably was, since I’ve never seen anyone else drinking it. Despite having a cool label, I was disappointed. Named after the Two Hearted River in Michigan’s Upper Peninsula, this beer claims to be an American IPA, but to me it seemed more like a heavy ale – more sweet than bitter, but overall pretty smooth and drinkable. I did some online research and this brew is ranked pretty high in online forums. Some people commented that the cans taste better than the bottles. We sampled the bottles, which might explain the mediocre score. The mysterious use of upper- and lower-case letters on this label matches the complexity of this brew. I found this unfiltered American golden ale light and refreshing, but some tasters felt it needed more carbonation. It was definitely the lightest beer we tested, and would be a good fit for fans of light beer. Only a true fisherman would recognize this as a fishy beer. 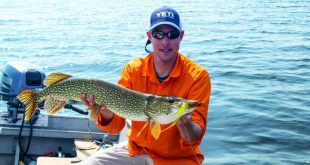 The can sports a pixelated sonar image of a bait ball as it would appear on a fishfinder. A clever graphic, indeed, and this is a tasty brew that scored well. I really enjoyed it and gave it an 8.8. Not too bitter, not too sweet, this fine brew is tough to beat! Fish, Ski, or Camp Overnight the Axopar 28 T Does It All….